They say when it comes to the qualities of Cheap, Fast, and Good, you can only pick two. 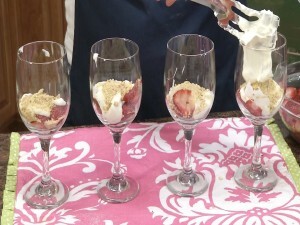 But when it comes to dessert, the Strawberry Cheesecake Parfait allows you to have all three! It’s not only quick and easy to make, but it combines sweet flavors with soft and crunchy textures for an after meal treat that’s almost as pretty as it is tasty! Slice 2 cups strawberries. The Rada Granny Paring knife features a reverse-curve blade that is perfect for slicing small fruits such as strawberries. In a bowl, combine 1 (8 oz.) pkg. cream cheese and 2 T. sugar. Once combined, add 1/2 C. vanilla yogurt and mix. 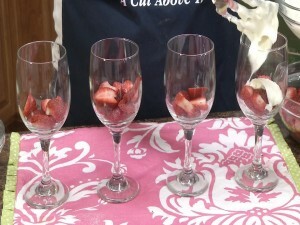 Evenly distribute 1/4 C. strawberries to the bottom of each wine glass. 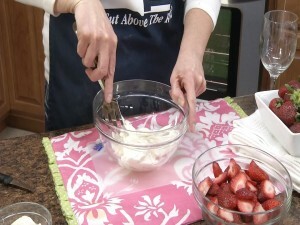 Place an eighth of yogurt mixture on top of the strawberries. Evenly spread the graham crackers among the glasses. Distribute remaining yogurt mixture on top of graham crackers. 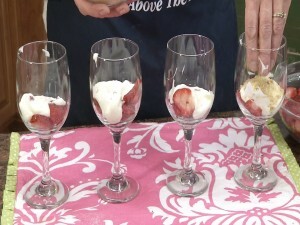 Place remaining strawberries on top of last yogurt layer. Serve this elegant dessert to grateful friends and family. Enjoy! The Rada Granny Paring knife is one of our most popular products, and not for nothing. 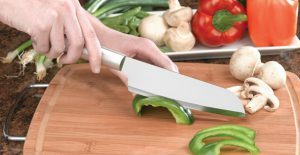 It’s the smallest Rada knife available, and one of the most useful, as its reverse-curve blade (also known as a bird’s beak blade) makes it ideal for cutting foods that you are holding towards you. Its design means that it’s perfect for cutting smaller foods like strawberries, or any item that you hold while cutting. Best of all, the Granny Paring is made in the USA, and comes with a Lifetime Guarantee! Order your own Rada Granny Paring at the online Rada Kitchen Store! 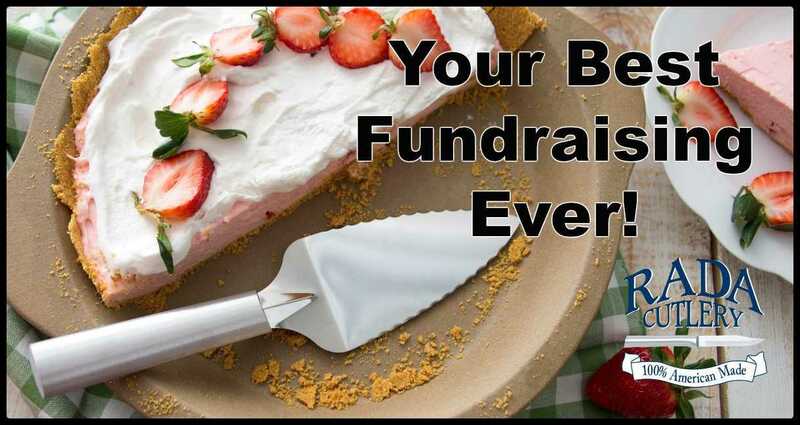 Fundraise the Easy and Successful Way with Rada Cutlery! Rada Cutlery is not only America’s premier kitchen product company, but also its most effective fundraiser! If you or someone you know has a worthy cause in need of precious funds, fundraising with Rada Cutlery is the way to go. Whether you’re involved with a nonprofit organization such as a church or charity, need funds for a school trip, or have a community group that does good locally, Rada Cutlery is there to help. Groups that fundraise with Rada can offer the company’s extensive lineup of kitchen products, items that are not only a great value, but that your supporters will actually want and use. Each sale makes an incredible 40% profit for your cause, so every bit of effort goes extra far! Check out our fundraising catalog to learn more about Rada fundraising! Check out the Rada Cutlery EASY guide to learn more about why a Rada fundraiser is your group’s best fundraising option! Rada’s vast selection of high-quality products can all be purchased online from the comfort of your home! 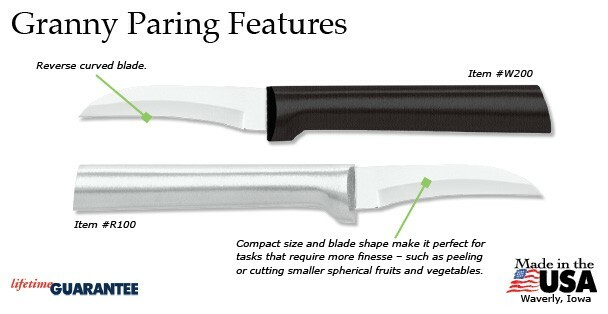 Rada Cutlery will be an invaluable part of your kitchen, and makes a great gift for others. All of Rada’s American-made cutlery and utensils come with a Lifetime Guarantee, so when you buy, it’s for life! Visit the online Rada Kitchen Store store today to fill your home with the best kitchen products around! Pin the Strawberry Cheesecake Parfait Collage! 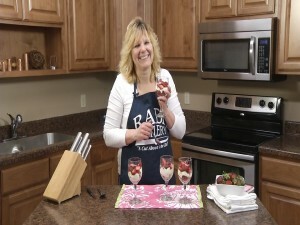 Hi, Kristy in the Rada kitchen, today I’m sharing a recipe for Strawberry Cheesecake Parfaits. This is out of our Quickies in the Kitchen: 30 Minute Meals cookbook. Actually, you can probably make this in way less than 30 minutes. 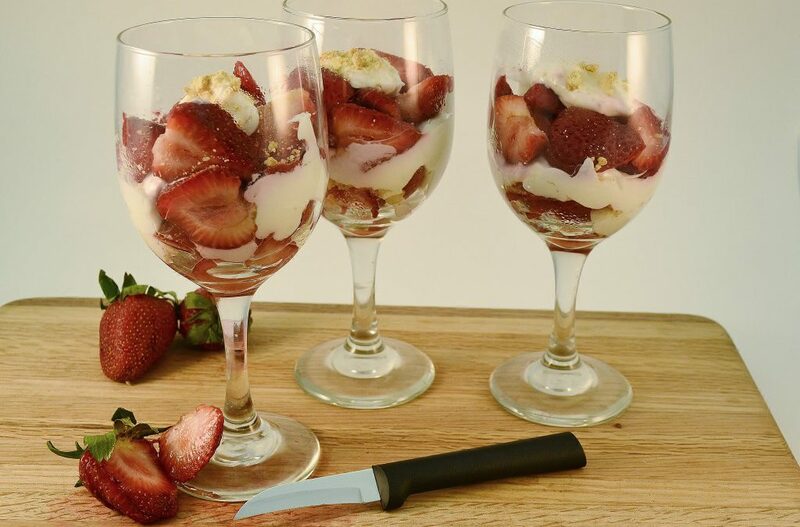 All you need are strawberries, some sugar, vanilla yogurt, graham crackers, and cream cheese, and some wine glasses, and it makes a beautiful desert in just minutes, so lets get started. So you need two cups of strawberries that have been sliced. 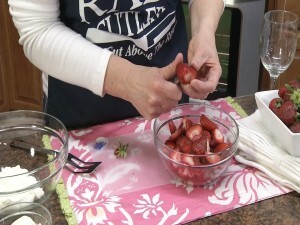 I love using this Rada Granny Paring knife, it gets the stem of that strawberry out, and it’s really easy if you like cutting towards yourself to slice a strawberry or the little bent tip. It makes it easy to slice them on a cutting board, too. You need two cups of fresh strawberries, and here we have 8 ounces of softened cream cheese, and to that we’re going to add 2 tablespoons of sugar. Now to blend this cream cheese and sugar and I’m using this Rada Serverspoon, it works as a spatula, it works as a spoon to stir, you can strain, it has the holes to strain, it’s got like 50 uses. Alright, so once you’ve got that sugar mixed in, we’re going to add half a cup of vanilla yogurt. And you just want to gently mix that in, and now it’s ready to be dished up. You’ll want to have ready 4 graham crackers that have been crushed, I’m using the regular ones, but you can also use chocolate graham crackers. 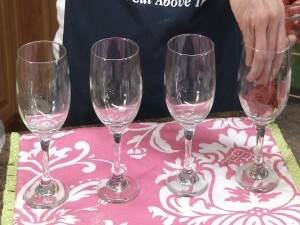 So now we’re going to make layers in our wine glasses. In the bottom you’re going to put about a fourth cup of the strawberries and then an eighth of your yogurt mixture, which is more or less just a little dollop. Then you’ll take a little tablespoon or teaspoon and just kind of flatten that out a little bit. Then you’re going to take a fourth of the graham crackers and then the yogurt mixture again, just an eighth of it, and this will actually be your last layer of the yogurt, so you can use it up. 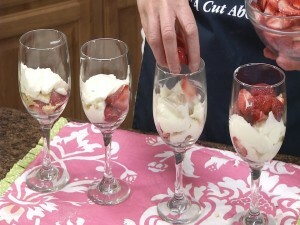 And then you’ll add another fourth cup of strawberries which will be your last layer. And there you’ll have a quick, elegant dessert in just a couple minutes. And that’s just one of the recipes in our Quickies in the Kitchen cookbook.